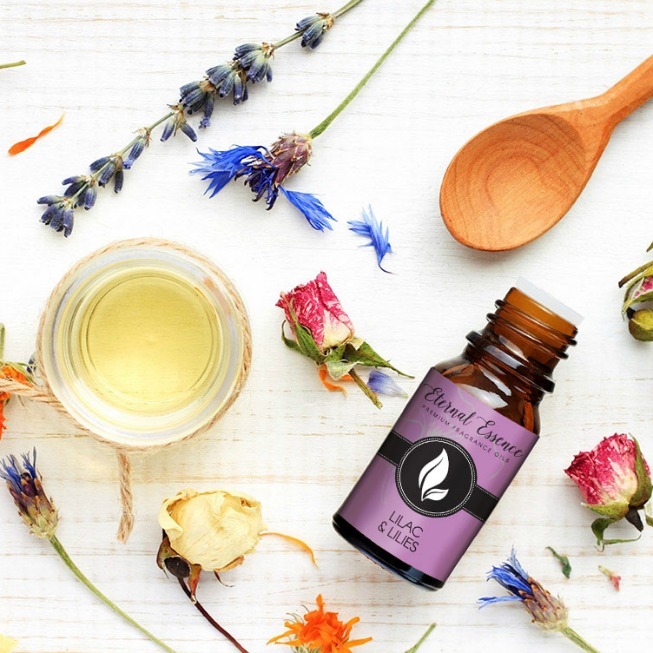 Our Premium Fragrance Oils are formulated to be suitable for creating your own candles, soaps, room sprays, skin and hair care formulations, cleaning products, for use in home aroma diffusers, candles, and with laundry, linens, and much more. They are perfect for blending with each other to create a unique aroma or using individually. Below are some Fragrance Oil Uses to help you to enjoy fragrance in your everyday. Check out our Pinterst & Facebook page for more creative Fragrance Oil Uses and ideas. Sprinkle your favorite Fragrance Oil into the wax near the wick of a candle before it is lit. As the candle burns, the oil will heat up and the fragrance will drift throughout the room. This is one of our favorite fragrance oil uses. Add several drops of Fragrance Oil to a spray bottle full of water. Use the spray in any room in need of a freshen up. Add several drops of Fragrance Oil to a box of baking soda and mix well. Allow this to dry for a day, then sprinkle the baking soda onto your carpet, and allow it to sit for 30 minutes to 1 hour. Vacuum to freshen carpet. Add several drops of your favorite Fragrance Oil to Potpourri that needs refreshing. This can be repeated as many times as you like. Place a few drops of Fragrance Oil on paper towels. Take the individual paper towels and place them between sheets, pillowcases, or towels. Add a few drops of Fragrance Oil to a cotton ball and place in the corners of your drawers to freshen up stored clothing. Pour the water and witch hazel into a spray bottle and add the fragrance oil. Shake well before each use. Washer: Add several drops of Fragrance Oil in your washing machine, after the water is filled, with each wash for fresh smelling laundry. Dryer: Use several drops of any Fragrance Oil on a six-inch by six-inch cloth and toss it in the dryer with your clothes for a dryer sheet solution. You can apply the powder a few different ways. 2. Make your own “shaker” out of any “lidded” container you like. You’ll just have to poke some holes in the top. Shake the shampoo over your dog, starting at the bottom and staying away from the head. Then, wait about 5 minutes or so and just start brushing your dog’s fur to spread the powder around. I use my hands and the brush to get a little around her ears, etc. *Remember that your dog is NOT ingesting the oil nor are you rubbing the oil onto or into their skin. The oil is there just for fragrance and there isn’t enough of a concentration to do any damage to your fur baby. Pour 1 tsp. of Rubbing Alcohol in a 3 oz. spray container. Add 30-40 drops of Eternal Essence Fragrance Oil of your choice (Lemongrass and Peppermint are good choices). Add water to fill the container and give it a good shake. Spray 3-4 times into toilet bowl before use to trap odors. Using a cheese grater, grate bars of dove soap into a large bowl. Bring water to a simmer in a large pot. When the water is simmering, mix in grated soap and coconut oil using a spatula. Mix consistently (but not non-stop) until soap is melted, approximately 7 to 10 minutes. Remove from heat, add several drops of your favorite Eternal Essence Fragrance Oil, and let it sit uncovered in the pot for 2 hours. Stir once after 2 hours and bottle it up into your containers using a funnel. An empty shampoo container works well. Pour 1 cup granulated sugar into a mixing bowl. Gradually add your favorite Olive or Coconut Oil and mix until you have a slightly wet, but grainy consistency. Add a few drops of Eternal Essence Fragrance Oil. Transfer the scrub to a container and enjoy this scrub, which one of our all-time favorite fragrance oil uses. Mix Fragrance oil and Carrier oil together well and pour mixture into a container for use. Small Bottle – something with a narrow mouth and wider bottom. Using a funnel, pour mineral oil into 3/4 of the bottle. Next add 1 tbsp. vodka. Add approximately 12 drops of your favorite Eternal Essence Fragrance Oil for every 1/4 cup of mineral oil that you have added. Insert the reeds into the bottle and cut as necessary, they should be approximately double the size of the bottle. In a large mixing bowl, mix flour, salt, and cream of tartar together. Add cooking oil and fragrance oil to the dry ingredients. In a small saucepan, add 1-cup water and food coloring and bring to a boil. Add boiling water to dry ingredients and mix until it sticks together. Allow to cool for a few minutes and then knead dough. Store in airtight containers. Refrigeration isn’t necessary but will make your play dough last longer. Scented play dough smells yummy so make sure you tell the kids not to eat it. When you want to use a Fragrance Oil in a cosmetic base as one of our favorite fragrance oil uses, you will want to perform an investigatory (lab-scale) batch first. This is because these oils have solvent qualities which, in too large an amount, can break down the chemical bonds in the base. Set your scale to metric units. With your beaker standing on it, tare the scale (setting it to ’0′). Pour in 30 g of base. Add 3 drops of the Essential or Fragrance Oil. Mix well, cap, and check in 48 hours. If the scent is good and it does not separate, you are good to go, but remember, the ratio to use is .05 or half of one percent, not 5%!! !